Overnight we were guarded by the mountain dogs howling, grunting, and snoring all around my tent. Love, how unconditionally these dogs cradle you with love even though you are a stranger (at least I felt so). When the morning sun shone the grumpy crows left no stone un -turned to shriek like our personal alarm clock. We all woke up early, all clueless as to what exactly made us so happy early in the morning. But one thing was sure, we looked forward to the day eagerly. With the sun overhead, we dared to splash some water on our face & relished a “high tea” in our small shepherd kitchen hut. The random company of students from Uganda & Uzbekistan over a cup of tea was literally the coming together of cultures. Well, that’s the beauty of travel! It was soon time for breakfast & we decided to eat out in the sun, amidst the white out views of our campsite. The dogs wouldn’t stop feeding themselves from our plates so we made a move for the first half of our day – Skiing on the slopes. 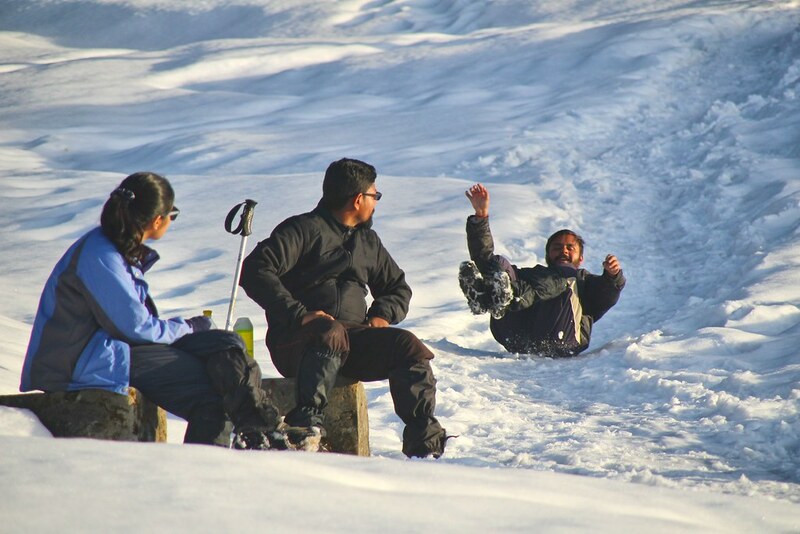 Skiing as a basic course is taught by the guides on Kedarkantha Trek . Their expertise can teach you a lot about perseverance & the skills of skiing at the same time. From side falls to bringing our skis to a halt, they even teach about the anatomy of the ski. And with a zillion sessions on warm up, practice & learning we made our way back to the lodge. 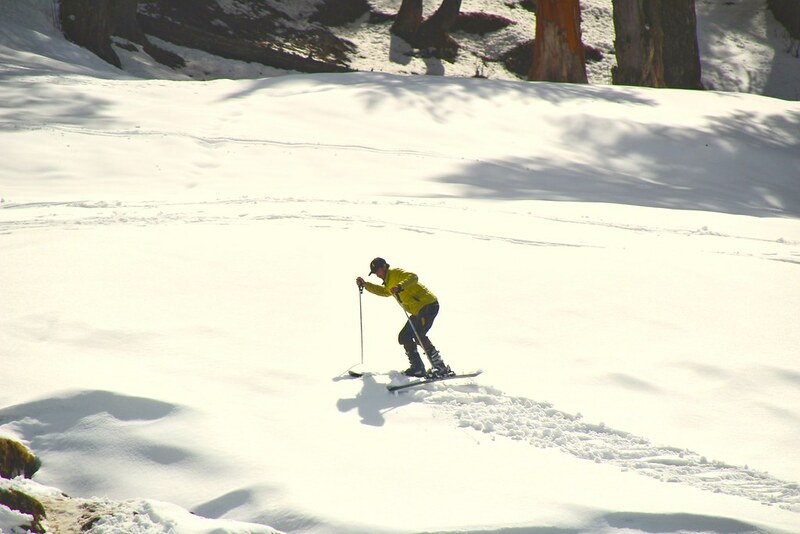 Skiing is an absolute adrenaline filled sport & I was sure to take up a basic Skiing course the next winters. The second half of the day was spent at leisure, soaking up the mountain sun & reviving each cell in our body. Once we took our camping stools out in the sun, there was just no looking back. We steadily immersed ourselves into the silence of the bells around the horses, the lazily hiding mountain dogs & a book to save from boredom. It was an ideal winter afternoon with snow clad mountains glistening along with the melting snow. Towards evening we were given a camp set up training in the open field. While the four of us (co –trekkers) relentlessly struggled to pack a sleeping bag, it was to no avail. It was a test of mental skill & we all failed miserably. But that’s the beauty of outdoors, you don’t fail here, you always take something back with you! The next session was an acclimatization hike for the following summit day. The trek leader gave us the do’s & dont’s on a peak summit & we were made to walk with crampons on our shoes & gaiters to protect the snow from sneaking into our shoes. It was an uphill hike of about a km, as the sunset enlightened the trail to Kedarkantha Peak. Soon our playful leader asked us to slide down the slope to let the child within, live again! With conversations around mountaineering, training your body & the insurmountable Swargarohini peak we descended to head back to our tents. The setting sun marking a horizon up in the sky and the fading bonfire adding to the pristine beauty, we called it a day early with a wholesome meal. Gearing ourselves for the following day which was to begin even before the sunrise, the night only lingered with excitement of the summit climb. PS – #StayTuned to read about the adventures, on the Final Summit Day! 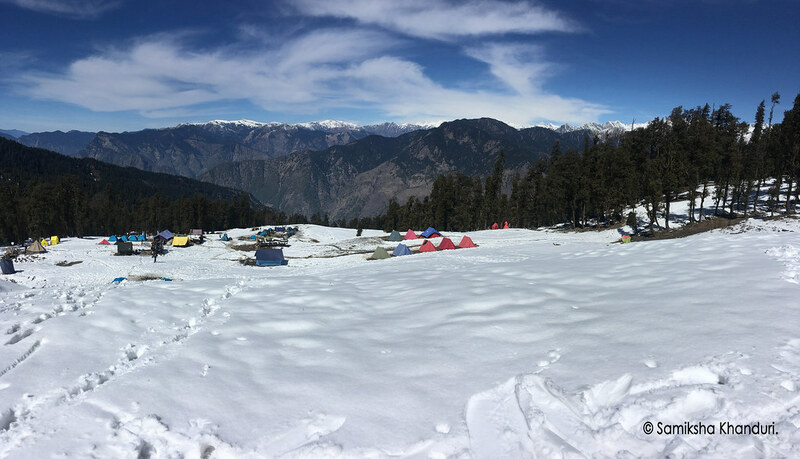 Previous articleKedarkantha Trek – Smitten by the Himalayas yet again! Hi, Nice blog! Can you tell me , at which phase of the year you visited Kedarkantha? And is skiing possible for December trek? Hi there! The best time to visit Kedarkantha is during winters. I did this trek back in February this year! Skiing completely depends on the snow conditions. So anytime post Mid January would be ideal.